The 2014 Design-Build for Water/Wastewater Conference recently took place in San Jose, Calif. Produced by DBIA and co-hosted by AWWA and WEF, the multi-day conference program was a huge success. Roughly 800 key players and decision-makers attended the conference this year — representing municipalities as well as companies operating within the architecture, engineering, construction and acquisition arenas. Executing the Delivery of Design-Build Projects. Design-Build Done Right Best Practices is a single source that clearly defines design-build fundamentals to significantly enhance superior project outcomes. The evolution of this document is based on input from DBIA members and the A/E/C industry. To read the comprehensive best practices, click here. The City and County of San Francisco Department of Public Works has issued an RFQ for design-build advisor services. The impending project is a Rehabilitation Detention Facility/HOJ Replacement Jail. Responses are due April 4 (extended from the original date). 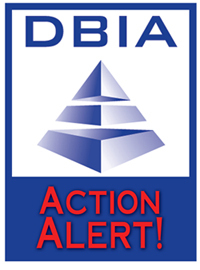 DBIA is partnering with McGraw Hill Construction on a new study to analyze the impact of delivery systems on building projects. We would appreciate your thoughts and encourage you to participate in the online survey. The survey seeks to reveal the benefits, drivers and obstacles both of widely used delivery systems, including design-build and construction management at risk, as well as of emerging systems such as design-bid-build-operate-maintain. When complete, the results will be used to produce a Delivery Systems SmartMarket Report (SMR), which will be widely distributed to the U.S. design and construction community. The survey will take approximately 15 minutes and is open until Tuesday, April 15. Your responses will be completely confidential and used for this survey only. All responses will be analyzed in aggregate, and no individual responses will be referenced or used in any way. In appreciation for your time, those completing the survey will have the option to receive this exciting new report. The call for presentations for the 2014 Federal Project Delivery Symposium is now open until April 23. Hosted by DBIA and SAME on August 19-21 in Washington, D.C., this Symposium provides a platform to highlight best practices in design-build project delivery in the federal sector and the call for presentations is now open. Details and the submission form are available at: https://www.designbuildfederal.com/call_for_papers.cfm. Some $67 million left over from Cleveland's Inner Belt Bridge construction project will be spent on widening a stretch of Interstate 75 south of Toledo, Ohio. The Ohio Turnpike and Infrastructure Commission voted to shift the money from funds it initially approved for construction of the eastbound bridge over the Cuyahoga River in downtown Cleveland to the I-75 project in Hancock and Wood counties. One of the nation's newest and most premier energy research facilities has been named R&D Magazine's 2014 Laboratory of the Year. Designed and built by SmithGroupJJR and JE Dunn Construction, the $135 million Energy Systems Integration Facility (ESIF) is located at the U.S. Department of Energy's National Renewable Energy Laboratory in Golden, Colorado. Its one-of-a-kind design will assist NREL, and its partners, to shape the energy systems of the future. The accompanying table shows 20 of the largest upcoming hotel and retail construction projects. They are all in the planning stage and are mainly new projects, but may also involve additions and/or alterations. Union Depot Achieves LEED Gold Status in St. Paul, Minn. The $243 million renovation of the historic Union Depot into a transit hub in St. Paul has earned LEED Gold certification by the U.S. Green Building Council. The designation by the national organization recognizes Leadership in Energy and Environmental Design, measured by environmental and sustainability best practices. Owned by the Ramsey Council Regional Railroad Authority, Union Depot initially sought Silver LEED status, but took extra steps to reach the Gold level. The CSX J&L Tunnel Modification project in Pittsburgh has been honored with several professional industry awards. The J&L Tunnel Modification Project is a part of CSX Transportation, Inc.’s National Gateway Clearance Improvement Program, a public-private partnership to improve freight transportation efficiencies. The focus was on raising the clearances in the J&L Tunnel to permit the movement of double stack container trains. The work was completed while the rail line remained open and was led by the design-build team of Michael Baker Jr., Inc. (an engineering unit of Michael Baker International, LLC), and Mascaro Construction Company, LP. Graves and Frost Highlight O.N.E. Conference Speakers in Blue Springs, Mo. The Annual DBIA Mid-America Region O.N.E. Conference will be May 8, 2014 at Adams Pointe Conference Center & Courtyard by Marriott in Blue Springs, Mo., and you won't want to miss this year’s keynote speakers including Greg Graves, P.E., Chairman, President and Chief Executive Officer of Burns & McDonnell. Ofelia Alcantara, Director | Design and Construction, California High Speed Rail Authority, Calif.
Samuel Atolaiye, Division Chief, Department of Public Works, Md. Dorota Budzynska, Project Engineer, Alameda County Water District, Calif.
Michael Clair, Student, Montgomery College, Md. Marlo Clowers, Senior Project Manager, Georgia Department of Transportation, Ga.
James Colby, Design-Build Coordinator, West Virginia Department of Transportation, W.V. Sarah Daniel, Highway Engineer, West Virginia Department of Transportation, W.V. Chris Delp, Project Engineer, Alameda County Water District, Calif.
Joseph Dongo, Program Manager, California Department of Transportation, Calif.
Christine Finney, Buyer II, City of Peoria, Ariz.
Juan Florensa, Director | Public Works and Utilities, Town of Longboat Key, Fla.
Greg Gamble, Director | Construction Management, Sacramento Regional Transit District, Calif.
Brian Hess, Director | Utilities, City of Liberty, Mo. Timothy Hochuli, Assistant Utilities Director, City of Venice, Fla.
Andrew Hoenig, Project Manager, Georgia Department of Transportation, Ga.
Charles Hunt, Director | Water Utility Development, City of Atlanta Department of Watershed Management, Ga.
Jeremiah Littleton, Transportation Engineer Specialist, Kentucky Department of Transportation, Ky.
Rick Morrow, Supervisory Bridge Engineer, California Department of Transportation, Calif.
David Ohlson, Associate Civil Engineer, City of San Jose, Calif.
Shane O’Nesky, Project Engineer, Alameda County Water District, Calif.
Zachary Partin, Sanitary Engineer, San Jose-Santa Clara Regional Wastewater Facility, Calif.
Jennifer Privette, Sustainability Manager, City of Newport News, Va.
Edward Van Keuren, Corporate Construction Manager, Waste Management, Pa.
Oscar Vasquez, Senior Transpiration Engineer, California Department of Transportation, Calif.
Michael Walsh, Project Director, Kitchell CEM, Ariz.
Brian Wilcox, Interim Director | Engineering and Crafts, The University of Memphis, Tenn.
New member listing as of March 24-March 30, 2014.